Immediately adjacent to Seneca Creek State Park is the Strider Wildlife Management Area, a 200-acre tract that was dedicated to wildlife conservation in 1949. 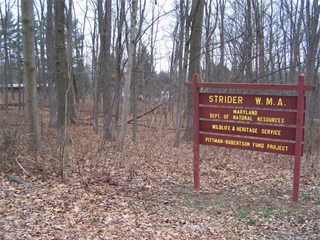 Strider's main recreational attraction is an archery range. A 10-foot high tower allows hunters to practice shooting from a tree stand. The archery range is open from April through November. Strider WMA is part of an expansive greenway in Montgomery County that stretches from Damascus to the Potomac River. Birdwatching and hiking are also popular activities on the area.